When you have a tooth bonding procedure, we will need to prepare your teeth slightly by using an abrasive solution to roughen up your tooth. We will not need to remove any of the actual enamel. This is an important distinction because it is one of the main reasons that people select this procedure. 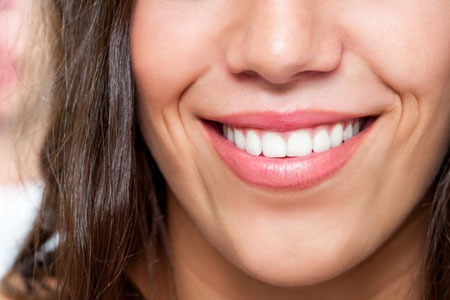 When using a dental veneer or dental crown to restore a tooth, enamel must be removed either from the surface of the tooth or all around the tooth. This can be irritating and makes the procedure permanent because once the enamel is gone it cannot grow back. Since the enamel remains intact with a bonding procedure, the process itself is fully reversible and more comfortable for patients of all ages. Once the tooth is ready, we will create the bonding material in a shade that matches your surrounding teeth. This is critical for ensuring that it blends in completely. Once ready, we will mold the material to your tooth and shape it until it looks completely natural. Whether the bonding material covers your entire tooth or is used to correct a minor chip, it will look like it belongs in place and the appearance will be seamless. One we are satisfied with the appearance of it, we will complete your tooth bonding procedure by using a special dental light to harden the material in place. Afterwards, you will have a durable and sturdy tooth that looks natural and gives you the ability to bite down with full force and enjoy all of your favorite foods without restriction. The process of dental bonding is incredibly easy as long as you visit a skilled cosmetic dentist. From a patient's perspective, the procedure is non-invasive, comfortable, and can be completed in one visit. From our perspective, great skill is required to shape the material into a position that looks flawless. Our depth of experience is what makes many of our patients visit us for their restorations and we are confident that you will be satisfied with the results if you choose to do so. What else can dental bonding be used for? In our dental office, we will sometimes use this procedure to cover dark stains. If you have tried teeth whitening and have some stains that are stubborn, the best way to deal with them is to cover them up. This can be done using bonding material or a dental veneer. We can also use bonding to fix some minor aesthetic issues like changing the length of your teeth. To learn more, call and schedule an examination.